Women Of Atenco Testify Against Mexican Police For Sexual Torture : The Two-Way In 2006, police sexually abused and beat women following a confrontation between protesters and state forces. Eleven years later, the Women of Atenco have taken the case to an international court. 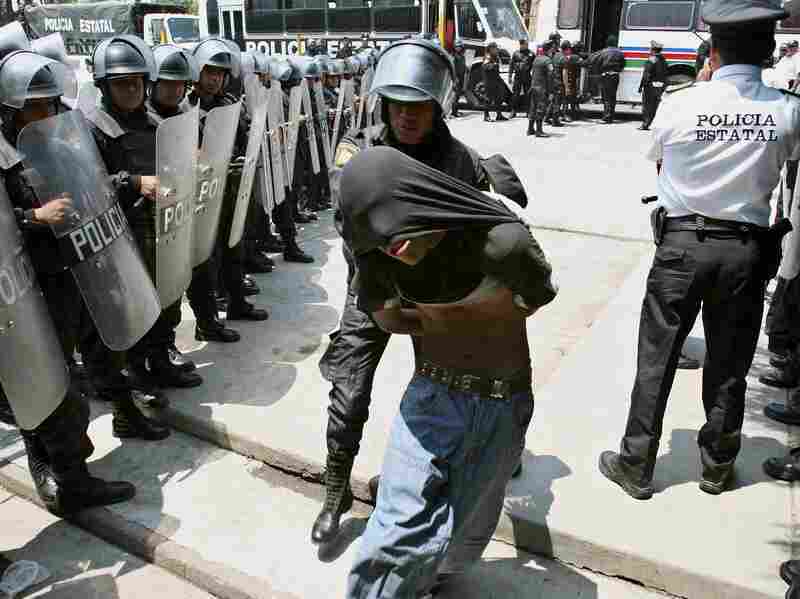 Policemen charge on protesters in San Salvador Atenco, Mexico, in May 2006, in efforts to reestablish order in the city. Two people died and many were abused in the battle that broke out when police attempted to remove peddlers from the city and neighboring Texcoco. 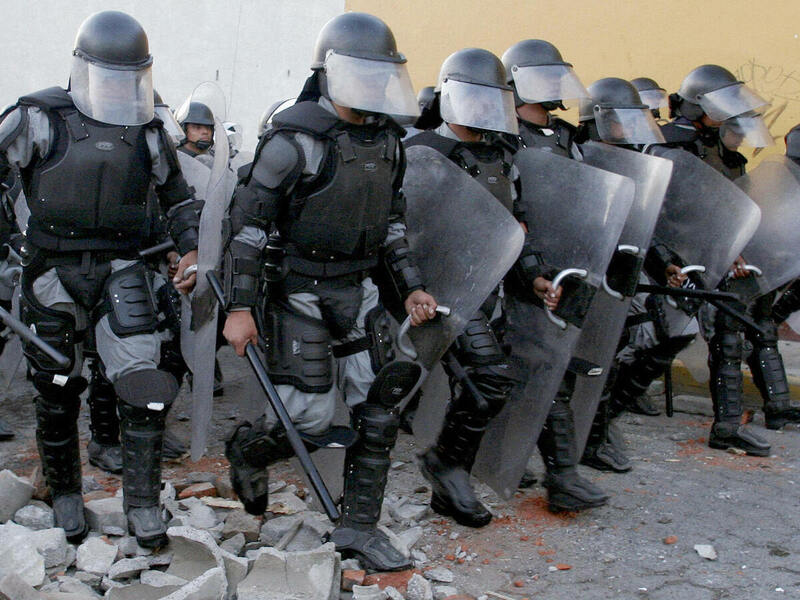 On Thursday and Friday, five women testified before the Inter-American Court for Human Rights and demanded an investigation regarding sexual torture at the hands of Mexican police forces. The abuse happened in May 2006 following a clash between protesters and state forces in the state of Mexico. During the court proceedings, which were posted online, the Mexican government said the state recognized the abuse and accepted responsibility in 2013, offering monetary reparations to the women. The "Women of Atenco," as they are called, refused the offer, saying they wanted those responsible to be held accountable instead. To date, no one has been held accountable for the violence. "Some police, I am not sure how many — I think there were more than three — began attacking me," Jimenez Osorio said. She described in detail how the officers sexually abused her. "When they finished, they invited the others to do the same," she said. "The Mexican government condemns any violations of human rights within or outside its territory," said Uriel Salas, representing the Mexican government in court. "Particularly, we condemn any acts of discrimination and violence." On May 3, 2006, police prevented a group of flower vendors from selling at a market in Texcoco. According to Narco News, the vendors belonged to the People's Front in Defense of the Land (FPDT), and were violently attacked by police forces. A protester who clashed with state riot police in the town of San Salvador Atenco is taken into the Santiaguito prison in Almoloya de Juarez, Mexico in 2006. Hundreds of police fired tear gas and pushed through human barricades to take control of the town. As the confrontation escalated, people from all over the country arrived to join the protest, including Jimenez Osorio, arriving from Mexico City. She was 23 years old, studying plastic arts and says she went to the town in a "grand act of solidarity." The five Women of Atenco who presented their harrowing testimonies to the court said the aftermath of the abuse was also horrific. They were incarcerated, with two of the women spending two years behind bars. According to their testimonies, they were called "liars" by the government when they attempted to report the abuse. "And the surviving victims have had to rebuild themselves, alone. But we cannot forget the state was responsible. It is important to sanction everyone responsible for these events. We are not requesting anything extraordinary. We are looking for the truth, we are looking for justice. And we want certainty that this will not be repeated. After all the pain we've been forced to live with, this is the minimum they could do." In a press release from the Mexican government, they said the state has taken "diverse actions of a structural character to repair the pain and evade the repetition of similar acts."